If you've spent a bit of time here on HedgehogsWithoutBorders then you know Tim and I have a very beloved four-legged member of our family whom we adopted from Southeast Asia. Belly, who came home with us from Elephant Nature Park in northern Thailand, is one of our biggest joys in life. He's silly, he's intelligent, and he's endlessly cuddily. And we never would have met him had we not visited the Park. Both Tim and I have always loved animals. For my part, I grew up in a house with upwards of four dogs and three cats (not to mention endless numbers of birds, fish, and gerbils) at one time. I am the person who pulls over on the side of the road when she sees a dog who is lost. I am much more likely to be found cooing over a puppy than a baby (very beloved nephews and nieces aside, of course). And so it's no surprise that we are prone to noticing how animals are treated in other countries when we travel. 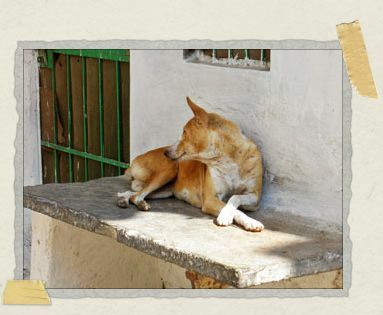 Prior to our India trip, we were warned that the way dogs are treated in India was quite sad. We were told the dogs would be undernourished, aggressive, and absolutely everywhere. While the cows were held in high esteem, we were told the dogs were not and it would show. Now, we didn't see many places in India, but we did see quite a cross-section during our time there. And while there were dogs everywhere, just as there are in South America, they were neither undernourished or aggressive. In fact, many of the dogs were a bit tubby and couldn't have been more laid back if sedated. Time and again, we'd walk past dogs who could care less that we were nearby. And while I'm no expert, I can tell you this: when dogs show no interest in humans, when they show no visible signs of distress when a person walks by, it's an indication that they aren't mistreated. If they were mistreated, they would either avoid humans, show signs of submission, or show signs of aggression. What they won't do is fall back to sleep right in front of you. That's not to say that no dog or other animal isn't mistreated in India. I'm sure they are in some places, just as they are throughout the United States. 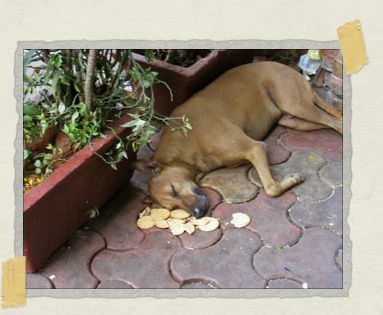 And that's not to say that no dog or other animal isn't malnourished in India. I'm sure they are in some places, again just as they are throughout the United States. 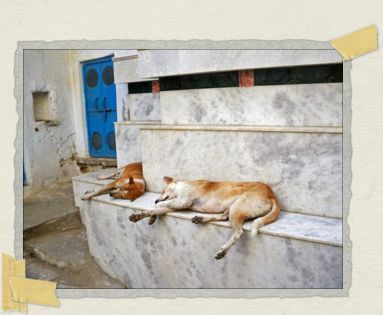 But I was impressed with how well the dogs were faring in India. I can't count the number of times we saw traffic divert itself because a dog was sleeping soundly in the street. Just like the cows, the dogs knew no harm would come to them. (And I don't know about you, but I can't imagine a dog not being hurt by lying in the street in the US.) 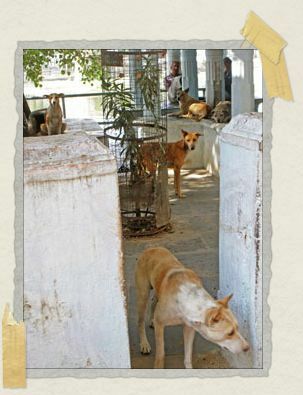 Over and over again, we saw locals bringing food out to the local street dogs and making sure they were doing well. In one instance where someone was (very clearly) joking about giving a dog a bit of a hassle, a nearby vendor (who hadn't seen the very silly antics of both dog and person beforehand) came over to berate the other person into leaving the dog in peace. I don't pretend to know enough about every culture of every country we've been to so as to theorize why dogs are treated well in one country and treated poorly in another. All I know is we've been to some countries where many of the dogs we saw were malnourished or sporting unhealed wounds or worse. India was not one of those places. One of the easiest ways for a country to fall on our good side is for the animals to be treated kindly. And already by our second day there, India was scoring quite well on the animal front. But it was one discussion in particular that really inspired our infatuation. While taking a peek at a few items they were selling, Tim and I shared Belly's story with a few of the volunteers: how we met him in Thailand, how he had a bit of a rough life there, and how he had adopted us and we, in turn, adopted him and brought him back to the States. They were very happy to hear that we loved Belly so much we wanted to give him a better life. "He's a very beloved dog," I said when the story was finished. Without missing a beat, one of the volunteers nodded and replied knowingly, "All dogs are beloved." Indeed they are, especially those doggies who need it the most. I like cats…less than dogs. I like the fact that all dogs are beloved, but I wish it could be equal for cats should be loved just as much as dogs. Mind you I only say this as I am MADLY in love with an animal lover who adores her cats and cannot wait until we get our own place so we can have them with us. The dog is also loved VERY much and I cannot wiat for us to adopt it as I've grown quite fond of her. Who ever thought I'd go ga-ga over cats and dogs? I guess it takes falling MADLY in love with an animal lover to make you see the world in a different light. It has been nine months since I fell head over feet for my beloved and I wouldn't change a thing. All animals (and some humans too) are beloved! We look forward to the day you guys can live with Emily's fur-babies too. There's something very wonderful about both cats and dogs, and we feel lucky to have China and Belly. You know, Turkey might be a fun place for you and Emily to visit one day. They love cats, absolutely adore them. Tim and I often refer to Istanbul as "kitty city" because there are so many happy cats wandering about.